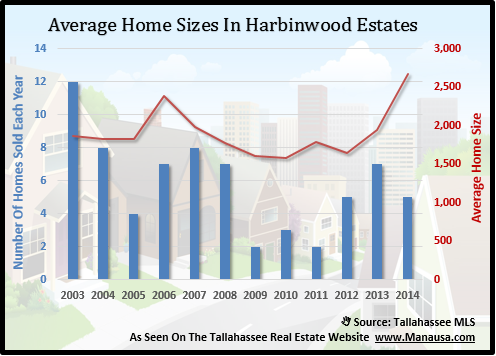 Located just to the south of Lake Jackson, one can find perennially popular Harbinwood Estates, with roughly 250 homes that have been consistent performers among the top selling neighborhoods in the Tallahassee real estate market. 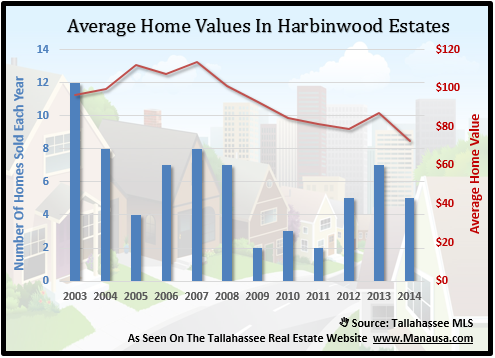 While not producing high sales numbers like the top 5 subdivisions (Southwood, Golden Eagle Plantation, Killearn Estates, Killearn Lakes Plantation and Bull Run), Harbinwood Estates does see enough home sales to often times drop into the top 40 most active neighborhoods in the Tallahassee MLS. Thus far in 2014, Harbinwood Estates ranks tied for #11 based upon 5 home sales with an average sales price of $194,900 and a value of $73 per square foot. Does that means you are getting a 2,676 square foot home for just under $195K right next to popular Lake Jackson? Currently, there are 4 homes for sale in Harbinwood Estates, 2 of which are already under contract. In the graph below, we see the number of closed home sales each year as blue columns (2014 is through 3/30), and the average home value, expressed as price per square foot, is shown as a red line. Similar to what we recently reported about home sales in Killearn Acres, we see that distressed home sales has brought average home values continually lower since the peak of the housing market in 2007. The increase in unit sales is a good sign that the housing market recovery is underway in Harbinwood Estates. Average home prices have been rising over the past two years, even as values have fallen. This is a classic example of why we don't simply monitor average home prices in the market, we must look at values and sizes as well. Smaller neighborhoods like Harbinwood Estates have fewer sales, thus more "noise in the data." One really big house sale can influence the trend for a year. 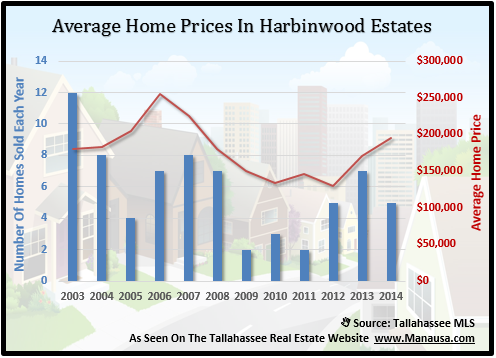 So how is it that we are reporting falling home values, yet the average home price sold in Harbinwood Estates is soaring through the roof? The answer is simple. We have to compare apples to apples. The larger homes sold recently have made for higher sales prices, but the average price per square foot for all sales is still on the decline. More than half of the past 22 home sales in Harbinwood Estates have been distressed, and this is keeping home values down. The following map shows the Harbinwood Estates homes that are on the market today. If you want more information on a particular home, simply click on the marker on the map and it will open up the listing to show you up to 25 pictures of each home. The following is a list of all homes sold in Harbinwood Estates (recorded in the Tallahassee MLS). I hope you were able to learn something from this Harbinwood Estates Home Sales Report, please drop me a note if you have any other questions or concerns that I can help you with.